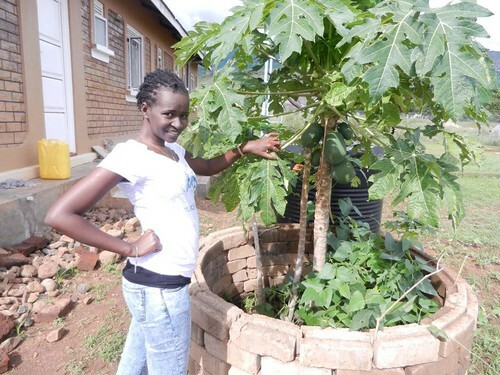 The photos show the irrigation of a bed of pawpaw trees using the waste water from the kitchen sink in the house the I was renting in Moroto, Uganda. The technique has worked out very well - the pawpaw trees have given fruit in less than two years and have been growing throughout the dry seasons... And now you see the lady renting the house after me enjoying the fruits! Last Edit: 24 Jun 2015 07:04 by HAPitot. Thanks for sharing. It is one more good news for grey-water believers like me. I also would like to share with you below my grey water dam which is already past its first year and is maintaing its good yield so far. A nice photo! Is it cabbage (zukumawick)? It is certainly growing much better than without the irrigation! It is spinach with good growth.